As the seasons go by: a grape grower’s landmarks. The arrival of winter marks the start of the grape grower’s work. The vines acquire their special golden purple colour. The vines are calling. We must not only cultivate the soil but also take up the shears, ready to cut. 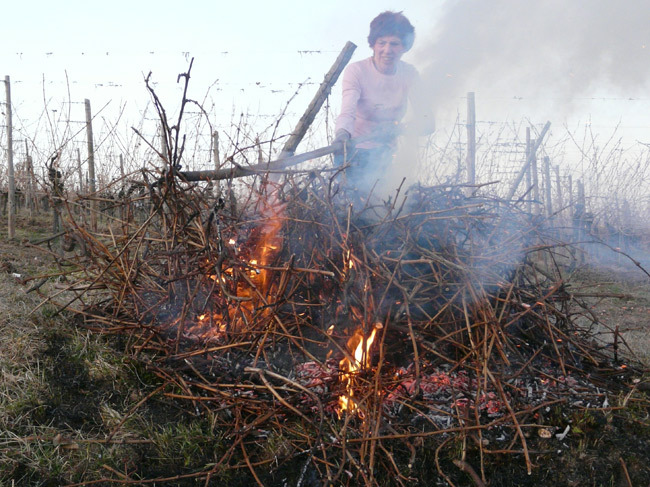 As the wintry conditions become more severe, we warm our hands in the dazzlingly bright flames of the little flare pots full of vine shoots. The cellars urge us to visit and take with us the newest wines. Once the vine shoots have been tied, the vines grow their first buds. This is when we see their true renaissance as a “miracle of nature” takes place, forcing us to hurry to complete the many tasks that await us, in an unchanging pattern: cultivating the soil, disbudding, bracketing, trimming, treating (copper, sulphur, nettle and horsetail tisane), to be repeated depending on the meteorological conditions, following a specific cosmic pattern. The end of the summer is also when we bottle the wines from last year’s vintage. The moment we’ve been waiting for, the fruit of a whole year of hard work completely devoted to the vine. In Beblenheim, next to the post office, we’re drinking a good new wine. As the sun sets on the horizon, the wind gets up and the vegetation takes on its special golden purple colour. It’s grape harvest time. The vine gives off the irresistible Autumn scent. In our impatience, we must remember to cut the precious grapes. My Father, like Kléber at the head of the Rhine army, decides which plots of land to harvest first. The brave little troop of grape pickers, armed with buckets and shears, sets off for a long hard battle. The branches, made golden by the sun, fall heavily one after the other. At the cry of “Eimer foll”, the grapes are taken to the press. There, the grapes offer no resistance whatsoever and the grape grower general takes their triumphant perfumes prisoner, victorious at the end of an arduous battle. Drunk with victory, our glorious “Herbsterlit” savour the delicious new wine. Grape pickers, I am proud of you!